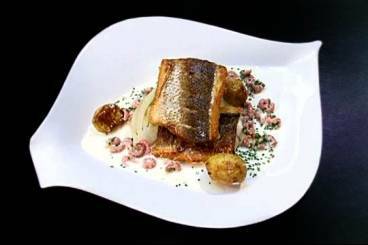 A crisp fillet of sea bass served with roasted baby potatoes, slow cooked fennel and a brown shrimp vélouté. Place the baby potatoes in a baking tray and drizzle with olive oil. Season with salt and then cook in the oven for 40-45 minutes. Cut the fennel in half and then cut each half into 3 pieces. Heat a frying pan to hot and olive oil. Season the fennel and then place in the pan. Cook until golden brown on both sides. Transfer to a baking tray and add the white wine and fish stock. Add a few sprigs of thyme and two cloves of garlic (crushed but with the skin on). Cover with foil and then cook in the oven for about 30-40 minutes until the fennel is soft. For the sauce: peel and finely slice the shallot and the garlic. Finely chop the chives. Heat a saucepan and add the shallots, garlic, white wine and thyme. Bring to the boil and reduce by half. Add the fish stock and reduce by half once again before adding the double cream. Just before serving, add the shrimps, chives and a squeeze of lemon juice and warm through. Check the seasoning. Prepare the sea bass: remove any pin bones and then lightly score the skin. Season with sea salt. Heat a frying pan and add a little oil. Once hot, add the sea bass to the pan skin-side down and cook until the edges of the fish turn golden brown. Transfer to the oven and cook for 2-3 minutes. Plate the fennel and then place the sea bass on top. Add the potatoes to the plate and finish with a drizzle of the brown shrimp veloute.